One thing we have been thinking about lately, is the fact that although you can lower the fat or lessen the sugar of a dessert, generally there is nothing redeeming about the final product. Its still empty calories, void of nutrients. This is why we try to add fruits, nuts, seeds, and other nutrient dense foods to our desserts, so there is something redeemable about them… and still DELICIOUS! 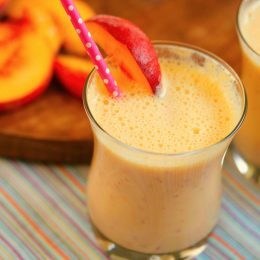 These Fresh Peach Coolers hit the spot when you are craving something sweet, need something refreshing and want to include lots of nutrients! We do like to let our kids indulge and eat sweet things. We really believe in balance and moderation and we don’t want them running to the neighbors pounding the candy because they feel deprived. Sometimes kids think they really need something sweet, when they really just need different nutrients to satisfy a craving. A lot of times, fruit provides the nutrients our bodies are craving when we think we need to eat something sugary-sweet. 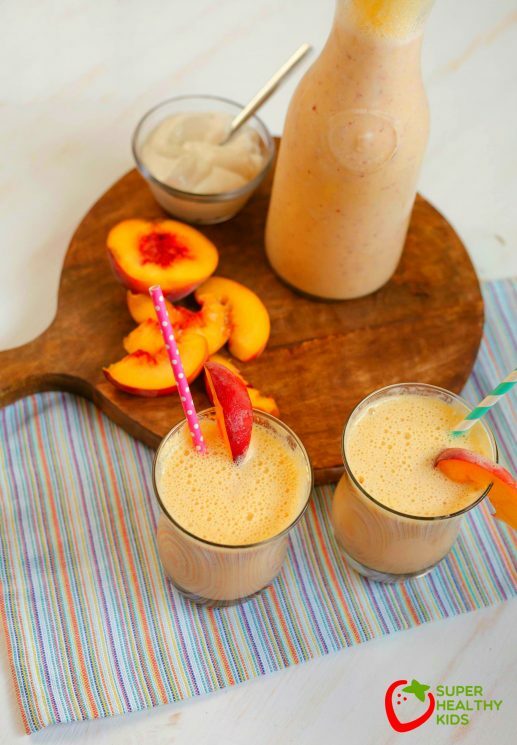 Peaches have a lot of natural sweetness, along with Vitamin A, Vitamin C, folate, potassium, and fiber. 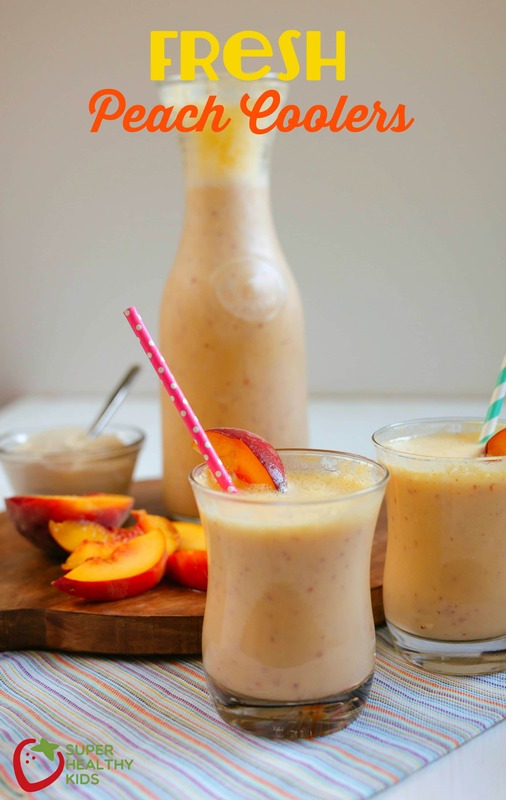 Peaches are so seasonal, that when they are on we are eating them everyday! Our peach season typically runs from end of July through September. We grow our own peaches, but then we always buy them also because we like to try different varieties. So when we get tired of just eating fresh peaches, we love to make this sweet drink! 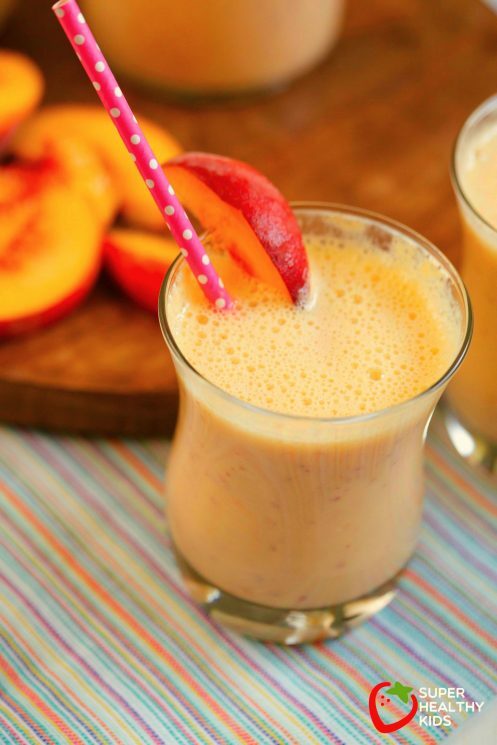 Pour into fancy glasses and serve with fancy straws to make this peach cooler a special treat! 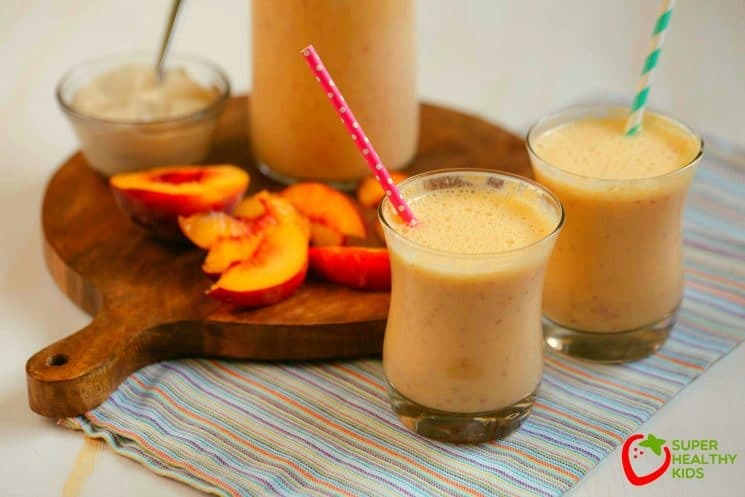 This is a drink that we really only make during this time of year because we use fresh peaches, but you really can make it all year long if you have canned or frozen peaches. We can our own peaches and don’t add any sugar because they taste so good just in their natural juices. If you buy canned peaches, make sure you buy the kind that says ‘canned in natural juices’. Otherwise there is a lot of added sugar. 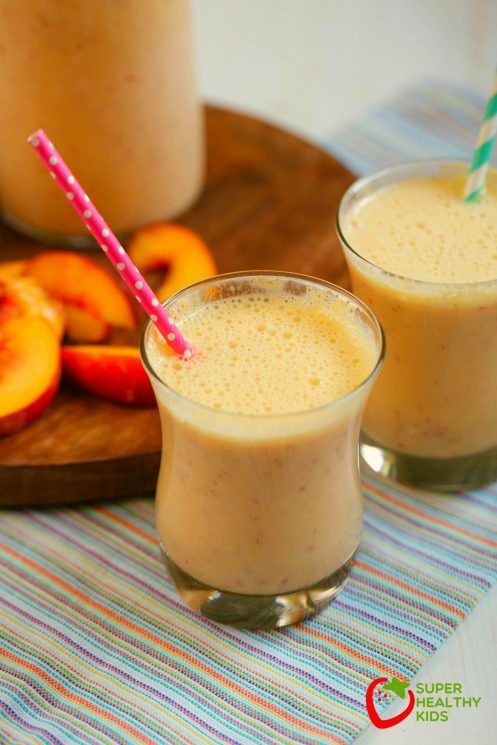 Give this fun drink a try next time you are craving a sweet treat! Blend until smooth, serve cold. Enjoy! Sure there’s sugar, but let’s focus on the wonderful fruit and the good buggies that live in the Greek yogurt! This looks delicious. As a bonus, freeze your Peach Splooshy and you’ve got popsicles! Mmm… that looks so good! But I think anything in those glasses would look good. We LOVE blender drinks here! I’ve checked out recipe books at the library and found a few at allrecipes.com. Perfect treat for a summer afternoon.